This recipe is adapted from [%amazonProductLink "French: Delicious Classic Cuisine Made Easy" asin=1843090619], by Carole Clements and Elizabeth Wolf-Cohen. Assemble the crust: Roll out the pastry as thinly as possible and carefully place it into the tart pan. (The sugar in the dough may make this dough a little more difficult to handle; if rolling becomes difficult, it's fine to press the pieces of dough into the pan and patch the cracks or holes with extra dough.) Press the dough into the flutes of the pan. Crimp the edges of the dough along the top of the pan. Bake the crust: Prick the pastry shell all over with a fork. Line the shell with aluminum foil and fill with dried beans or pie weights. Bake for about 15 minutes, until the edges are set and dry. Remove the foil and beans and bake for five to seven minutes more, until the shell is golden. (Watch the browning process carefully; if the edges begin to brown, place strips of foil along the edges to protect them from browning too much.) Set aside the par-baked crust, but leave the oven on. 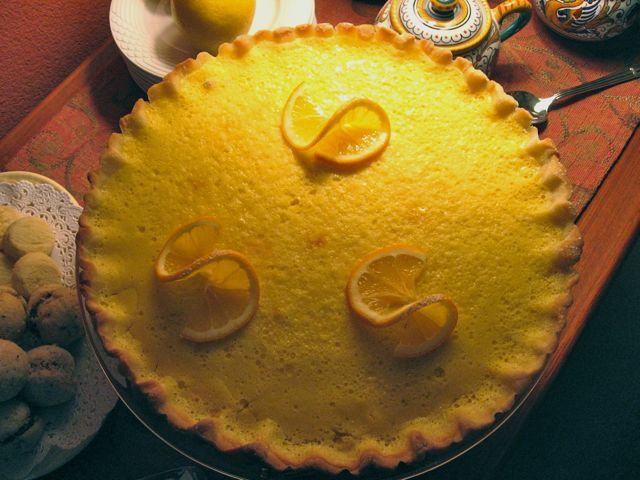 Make the filling: In a large bowl, beat together the lemon rind, juice, and sugar. Gradually add the crème fraîche and beat until well-blended. Beat in the eggs, one at a time, then beat in the egg yolks. Pour the filling into the par-baked pastry shell. Bake the tart: Bake for 15 to 20 minutes, until the filling is set. Finish the tart: Let the tart cool completely on a rack. When ready to serve, dust with confectioner’s sugar and decorate with twisted lemon slices if desired.